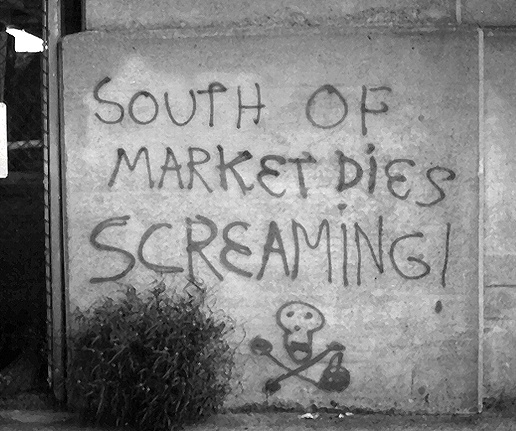 Graffiti in the SOMA: South of Market Dies Screaming! More than any other neighborhood in the city, South of Market is the part that contains the whole: the one matrix that subsumes unto itself every successive layer of urban identity in the history of the city. Here indeed is the anchor district of San Francisco: the site of all of its early institutional life: churches, orphanages, schools, unions, hotels, and public institutions. Here is the residential district of its most diverse population. . . . South of Market was an urban district containing the full formula of the city. --Kevin Starr, South of Market and Bunker Hill, California History (Winter 1995-96). Market Street is one of the primary corridors of San Francisco. It cuts a sharp diagonal across the city from the Ferry Building to the base of Twin Peaks. The trolley rails along Market Street have long marked a physical and psychological boundary (the Slot) between the area north of Market, where the local centers of political and commercial power are situated, and the predominantly poor and working-class area South of the Slot. 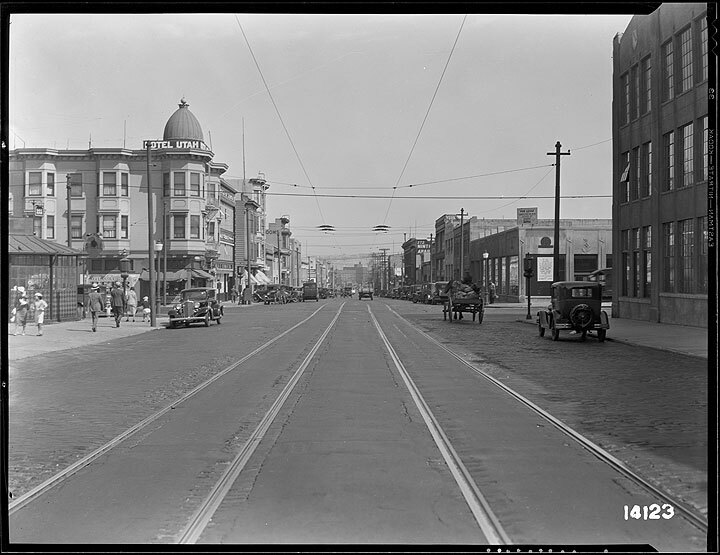 Southerly along 9th Street at Howard, July 18, 1933. While the ethnic composition of the transient poor changed, the general character of the neighborhood remained relatively stable until the 1950s. Then came the era of slum clearance and urban renewal.